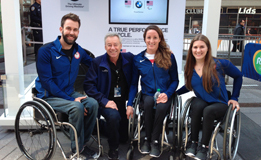 Roger Muller caught up with Stay-Focused alumni/BMW-sponsored, Paralympic athletes, Aaron Pike, Tatyana McFadden, and Chelsea McClammer at the Team USA Road to Rio Tour 100 Days Out! in Times Square on Wednesday, April 27, 2016. Having just arrived in NYC on Monday night from London, where all three competed in the London Marathon on Sunday, April 24, it was a busy day of events, interviews, and lots of photos. It’s actually 133 days out for our athletes who are all looking forward to September. And all of us at Stay-Focused are wishing them all the very best!